We’ve had collectible card games, living card games that were slightly less collectible, we’ve had deck building games, deck mixing games… . Fantasy Flight Games and Magic: The Gathering designer Richard Garfield have come up with something new: Unique Deck Games. In this new kind of game you don’t do any sort of collecting or deck building. You open a card back and it contains a playable deck that is completely unique in the world. The first – and, for now, only – Unique Deck Game is KeyForge: Call of the Archons. Each deck in this game will contain cards from three of the great houses of The Crucible, a world built by the godlike archons in search of their own history. I’m very much looking forward to some more detailed previews, because I see some potential problems with the system that I’d like to know how they’ll be addressed. Like, how do I know that some decks won’t just be plain worse than others? If they are really all unique it’s sort of unavoidable. Let’s see how that turns out. Atlantis is sinking. While everyone else is thinking about escape the players of Atlandice want to fill their pockets first. Using dice to select a district of the city they collect different resources. Additionally they use the districts’ special actions to their advantage. There’s not much time, though, the clock counting down in the center of the board is merciless. Where is 7 Wonders headed is always a question of interest, because we’re still not tired of the world’s greatest drafting game. Right now the answer is: out to sea. The next expansion will be 7 Wonders: Armada, and new cards won’t be all it brings. With this expansion each player will have a naval board where ships in the well-known card colors set sails. When you pay to play a city card you may pay an additional price to move the corresponding ship forward. Rewards for advancing your ships also depend on the ship’s color. The most interesting seems to be green, which allows you to discover an island and put it into play. 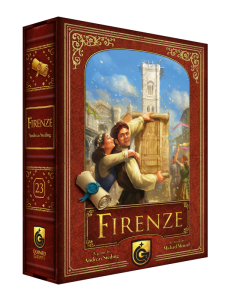 The third new release coming this year from Quined Games doesn’t need much of an introduction: Firenze by Andreas Steding. The tower building game was first released in 2010 and will now return in a new, language independent version. Nothing about the game seems to have changed, and why would it? Firenze was pretty perfect already. So you’ll still build those towers, make sure they are not torn down because you weren’t paying attention to them, and complete projects for the church and noble families. Just like old times. Quiet assassins. Shadows in the night. Not exactly team players. The Ninja. Despite that last part, Backspindle Games’s Essen release Ninja Squad starts out as a cooperative game. All players together sneak through the Imperial Palace, past the Shogun’s Guard, collecting equipment to rid the country of the shogun. But as soon as that mission is fulfilled the cooperation ends. In the second half of the game, played on the back of the game board, each player is out for themselves. The first ninja to reach the Blue Forest will earn all the glory for the mission. But everyone’s a ninja, so there’ll be some tricks up their black sleeves. And the Shogun’s Guard is still around. The city of Petra, Jordan, is unique. At the end of a long canyon most of its buildings are carved directly into the rock. It’s surprising that there aren’t many more games in this amazing setting. One is coming now. Passing through Petra is a game about merchants in the city that is so conveniently located where the most important trade roads meet. To trade they’ll push trade tiles through the long canyon to finally add them to their marketplace. Beyond that they’ll use what the announcement post describes as “movement based action selection” to spread their influence through the land. I’m not sure if a sculpted plastic canyon was strictly necessary, but it does look quite fancy. Asmodee Germany have posted a little teaser for the coming Libellud game Shadows: Amsterdam. A crime has happened in the Dutch capital. The police are in the dark. A mysterious interested party has hired not one but two detective agencies to solve the case. Both agencies have their informers to interview, and it’s going to be a race who cracks it. It won’t be easy because the informers will only speak in pictures to tell the detectives where to look for evidence. The part of matching the informers’ pictures to the illustrated game board sounds like it was inspired by Mysterium, but with two opposing teams locked in a real time race. What can I say other than “yes, please”? Either you love Legacy games, or you hate them. I’m firmly on the love side. Whichever side you fall on, though, one thing is clear: The idea is here to stay. And there are always more games that can be even more awesome after the Legacy treatment. 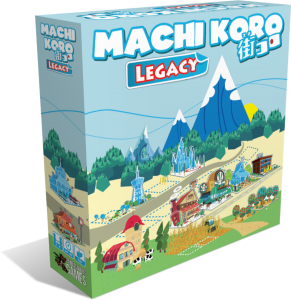 The latest of those is Machi Koro. The quick, light city building card game will return next year as Machi Koro Legacy, faithful to its legacy and with a ten game story arc full of surprises. There’s only one downside to getting ever more Legacy games. When are we supposed to play them all? In the last preview for Plaid Hat’s Guardians we had a look at the superheroes fighting. This week we see what they are fighting over. The whole point of Guardians is to gain control of location cards. Each location has a special effect changing the rules of engagement there, and each location has a control track. Move the marker on the control track all the way to your side and you win the location. Collect enough points from those and win. Sounds simple, right?